Tomorrow night is Christmas Eve. But it’s also the fiftieth anniversary of one of the most exciting events in human history – when the three astronauts of the Apollo 8 mission travelled round the Moon. These days, we tend to forget just how huge this event was. Like most of the US space programme in the 1960’s, it was carried out in a rush caused by the prevailing fear that the Russians were gaining ground in the space race and about to launch the first manned moon landing attempt. If like me you weren’t around at the time, there were a couple of pivotal moments that it’s worth reliving. The second event left an even more indelible mark across the collective human psyche: the first ever Earthrise viewed from another world. It’s one of the most famous photographs in the world. 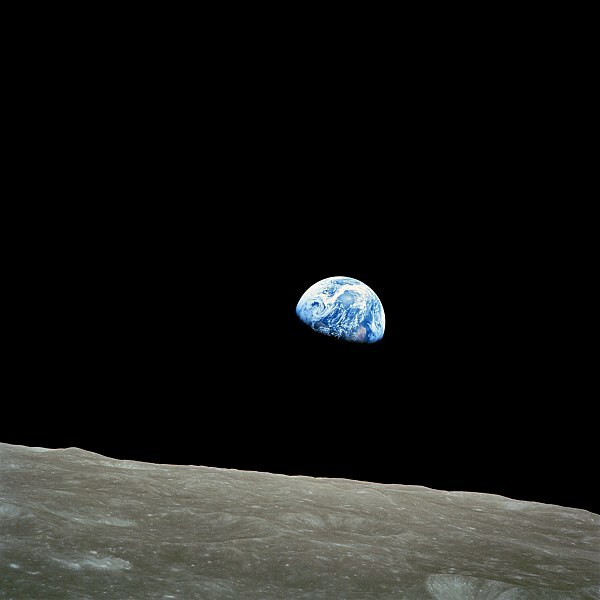 The impact of that photograph showing earthrise across the lunar surface was seismic: for the three astronauts who witnessed it firsthand, it was life-changing. But the impact felt by the rest of the species back on earth was greater. Because for the first time, it became all too clear just how small and fragile our colourful planet was, and how no barriers of race or belief could ever be visible from the orbit of another world. Out of that one photograph and a global television audience that watched the events of Christmas Eve in 1968 came the birth of the modern environmental movement.